There are over 20 species of selenicerius, commonly called Night Blooming Cereus. Most are native to Cuba and Jamaica, but are also found in other warm climate areas such as Florida and the islands of the Bahamas, West Indies, Central America and Mexico. Selenicereus Grandiflora is a slender climbing cactus with tough aerial roots that will cling to rough support such as tree bark. Branching occurs at intervals and can be induced by cutting off the tops of leading stems. The shape of the stem is basically cylindrical with four distinct ridges (sometimes more). These ridges extend along the entire stem and are covered with short sharp spines. Buds develop along them and first appear as small spheres which are covered with white downy hairs. The flowers open only at night and can be up to 10 inches across. Individual flowers are shaped like a starburst and last but one night, wilting with the onset of daylight. The underside of the outer layer of petals is a softly pink tinted beige. The rest of the bloom is pure white with bright yellow stamens. Night Blooming Cereus propagation is easy. If stems are allowed to grow along the ground, they will root at intervals and send up suckers which you can transplant. You can also take 12 to 18 inch tip or stem cuttings during the growing season. Keep cuttings out of direct sunlight a couple of days until the ends are dry and look calloused. After that you can plant in pots to get them started for later transplant, or directly where you want them to grow. Water thoroughly when first planted - then only when soil is dry. Remember, they are climbers and need vertical support where they can grow unhindered. 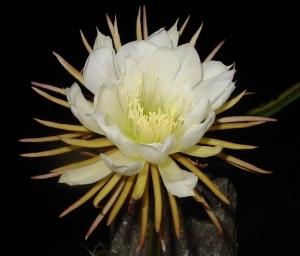 This particular species (selenicereus grandiflora) of Night Blooming Cereus can withstand some frost. Ours is about 30 years old and has taken over a 60 foot pine tree where it nightly displays hundreds of blossoms over a period of several weeks in early summer. We have had several winters where temperatures were in the teens for short periods of time.